Pumpkin, chocolate, cinnamon and cream cheese AND sprinkles inside a cutie pie cupcake liner. Can I end this blog post? Doesn’t that describe in one easy sentence why you should just scroll down for the recipe?! 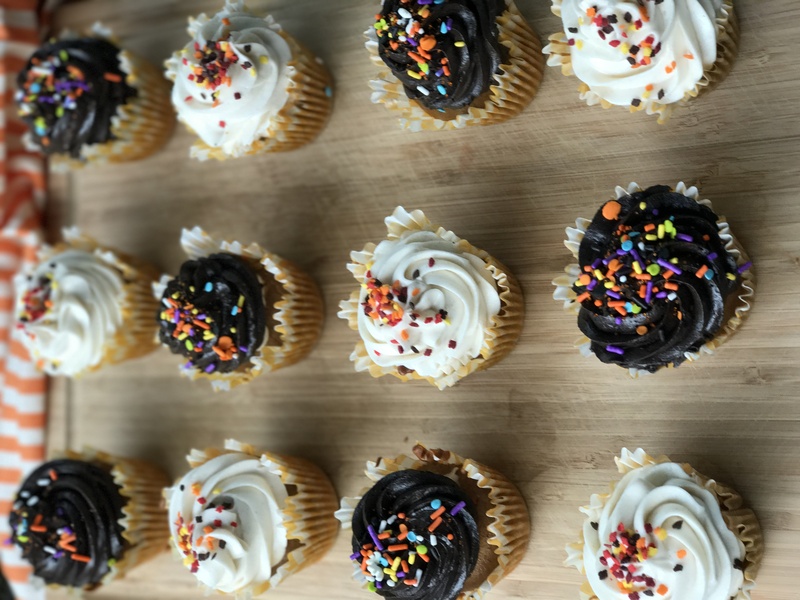 Okay, I guess I should actually tell you about these glorious cupcakes even though I believe the addition of sprinkles alone is the best reason ever to make something! It’s also my first recipe to kick off #chocotoberfest ! 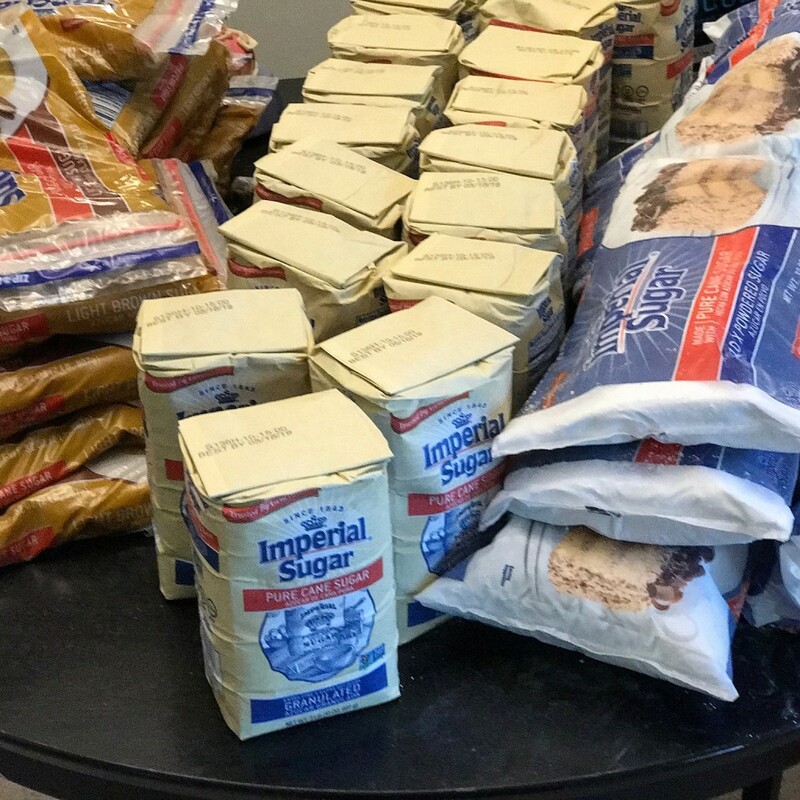 Y’all I have to tell you that Imperial Sugar really hooked me up with enough sugar to bake all the Fall season! They sent me 40 pounds of granulated sugar, 24 pounds of light brown sugar and 24 pounds of powdered sugar! 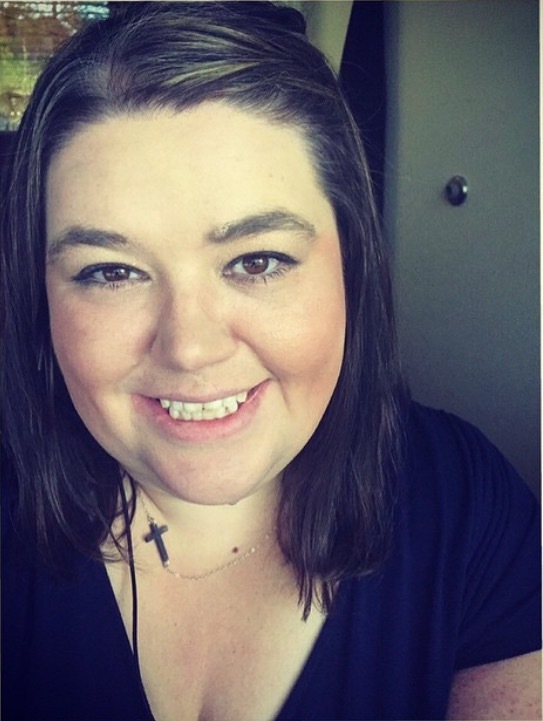 They are also the Gold sponser for #choctoberfest and have helped me be apart of a sweet giveaway where you can win for over $450.00 in prizes including 112 pounds of sugar of your own! Click this image to be taken to the giveaway post which is announced in 4 days! So thanks Imperial Sugar for making these Pumpkin Chocolate Cinnamon Cream Cheese Cupcakes possible! You’re probably thinking one of two things right now. Pumpkin and chocolate are something that shouldn’t be mixed or oh my goodness I need to make these now. Let me assure you they are the perfect flavor combo and the addition of chocolate makes them year round friendly. No matter which side you fall on I promise you’ll love these and so will your sweetie peas or your class mates or your co-workers or just you if you want to eat them for a week! I actually was making these for a giveaway I shared and the person requested pumpkin and chocolate so this is what happened! My birthday is actually on Halloween so I tend to get way excited about all the colors and decorations that I can play with! The thing is you don’t always want your Halloween to be scary or ghoulish. Sometimes keeping them light and sprinkle-y you keep them simple and festive without grossing people out. Don’t get it twisted though- I also like the scary stuff! 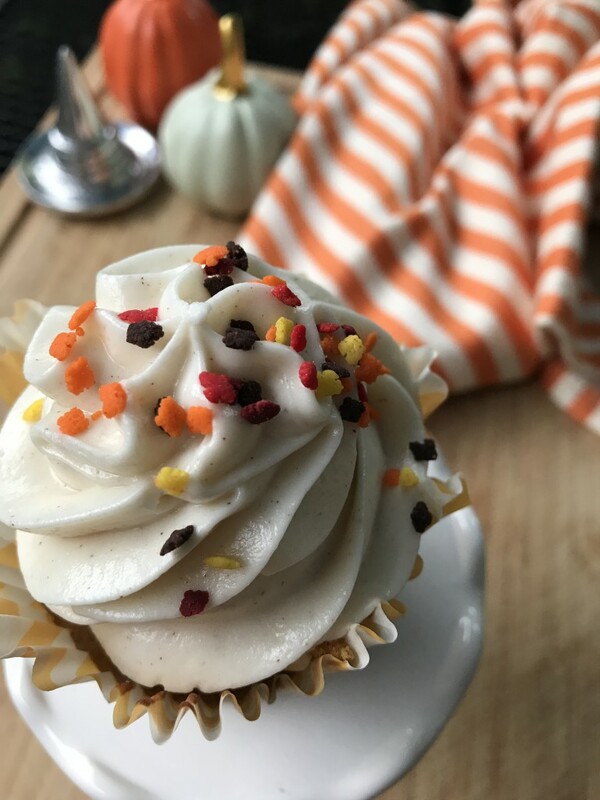 The cream cheese frosting is so creamy and full of cream cheese flavor which is perfect against the pumpkin cake. Its even a good piping consistency y’all! 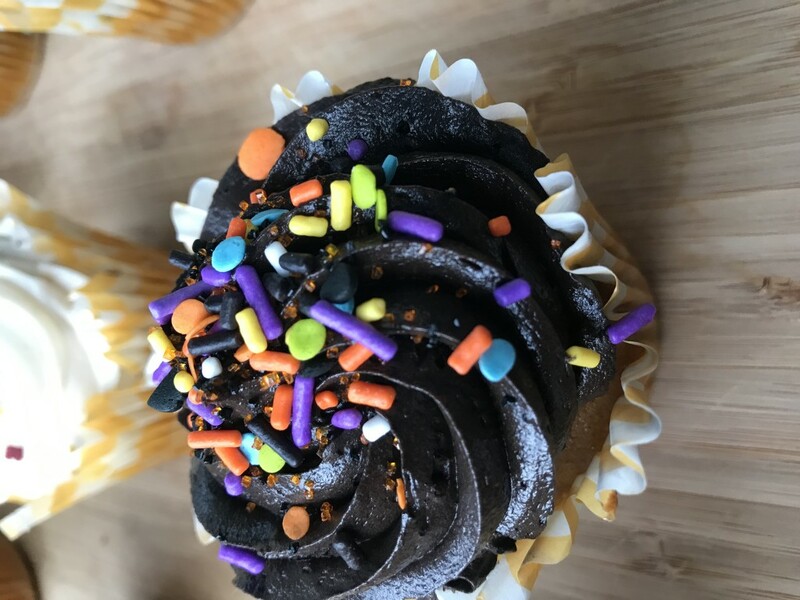 Everything about these Pumpkin Cupcakes with Chocolate Cinnamon Cream Cheese scream Fall and Halloween if you’re obsessed like me! Finally, I used Halloween sprinkles on the dark ones and sweet fall leaves on the vanilla cream cheese because sprinkles just make you smile. Yum, Yum, Yum! Pumpkin Cupcakes with Chocolate Cinnamon Cream Cheese for days! -don’t forget to pick cupcake liners that compliment your cupcakes because as you can see they make a difference! -if you can take your eggs out beforehand and let them get to room temp as they blend better this way which equals better results in baking. -same thing with buttermilk- room temp is best. If you don’t have any make your own! 1 tablespoon of vinegar or lemon juice into the measuring cup and fill the rest of the way to 1 cup and you will have buttermilk in 10 minutes! Add all ingredients to mixer bowl using only half of your powdered sugar, vanilla, & heavy cream. mix your vanilla and buttermilk and pumpkin together and set aside. Sweet things happen when families are together in the kitchen. Since 1843, Imperial Sugar has been at the heart of family traditions and celebrations. This holiday season, create some lifelong memories when you bake with love and Imperial Sugar. Click here to visit their website for their Halloween contest! Imperial Sugar Scary Recipe Scramble! 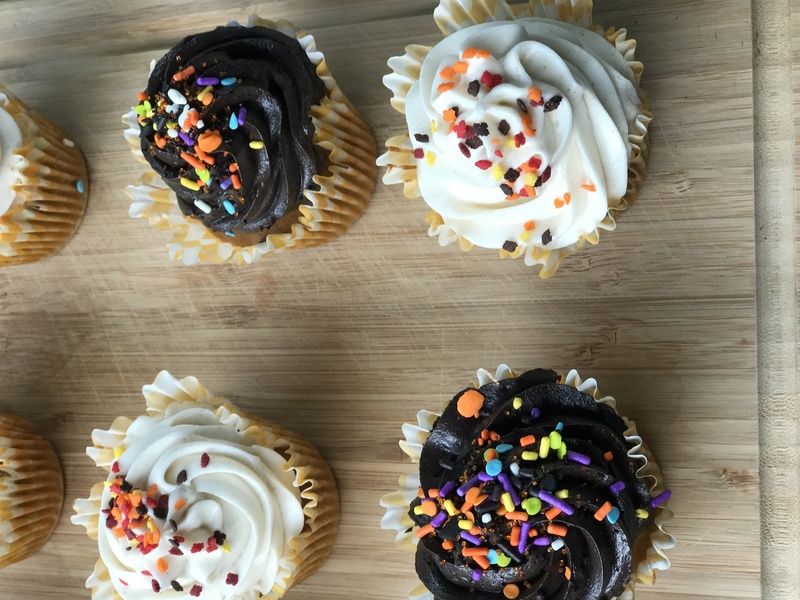 Scroll down to see what our other bloggers are posting today in #choctoberfest! 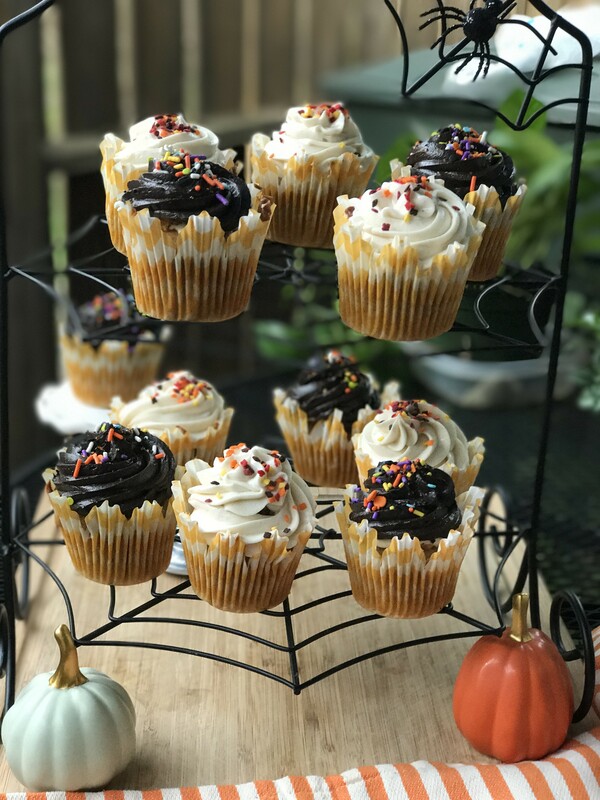 This entry was posted in choctoberfest, Cupcakes and tagged #amazing, #baking, #blog, #breakfast, #butter, #buttercream, #cake, #chevroncupcakes, #chocolate, #chocolatecreamcheese, #chocolatefrosting, #choctoberfest, #cinnamoncreamcheese, #cupcakes, #fall, #fallcupcakes, #feedfeed, #food, #foodblogger, #foodie, #frosting, #giveaway, #goodness, #grace, #halloween, #happy, #holiday, #holidayrecipe, #homemade, #humpday, #imperialsugar, #joy, #kingarthurflour, #nomnomnom, #october, #pinterest, #pumpkin, #recipe, #sprinkles, #sugar, #thankful, #thatsdarling, #thebakefeed, #vscocam, #wednesday, #yum. ← Choctoberfest 2017 with Imperial Sugar is here with a sweet giveaway! Ooooo , I have never heard of chocolate cream cheese. Thanks look so yummy. Cant wait to try it out. Adding this recipe to my fall recipe collection ASAP. Thanks for sharing! This recipe is so refreshing Jennifer, my sister has to help one of her girls this week to make a cake from a vegetable, so I’ll be sending her here. They look delicious. These look delicious!! I’m totally making these tonight. & happy early birthday! I never would’ve thought to put chocolate frosting on these. What a great variation! These look absolutely delicious. I’ve never heard of pumpkin cupcakes but this sounds delicious. I feel like I need to try this recipe. Thanks for sharing and happy birthday. Lucky you being born on Halloween!! These look and sound incredible! I’m going to have to make them, even though I don’t care for pumpkin anything. These sound unbelievably tasty and festive! What a sweet way to bring all kinds of delicious fall flavors together. These look amazing! I’m a sucker for all things pumpkin like most americans and these are killing me! Pinning for later! These look delicious! I can’t wait to make them! And I love that you out some baking tips in before hand. I haven’t done the trick with the eggs, but I’ll definitely have to give it a try! Wow! You make these look so delicious! They are beautiful! Yum! I can’t wait to make these with my kids. I love the sprinkles. These sound so good! I love scratch sweets! These look SO SO GOOD! Thank you for sharing this recipe! I’m in the I need to bake these right now camp. I’m so jealous of that load of sugar!! 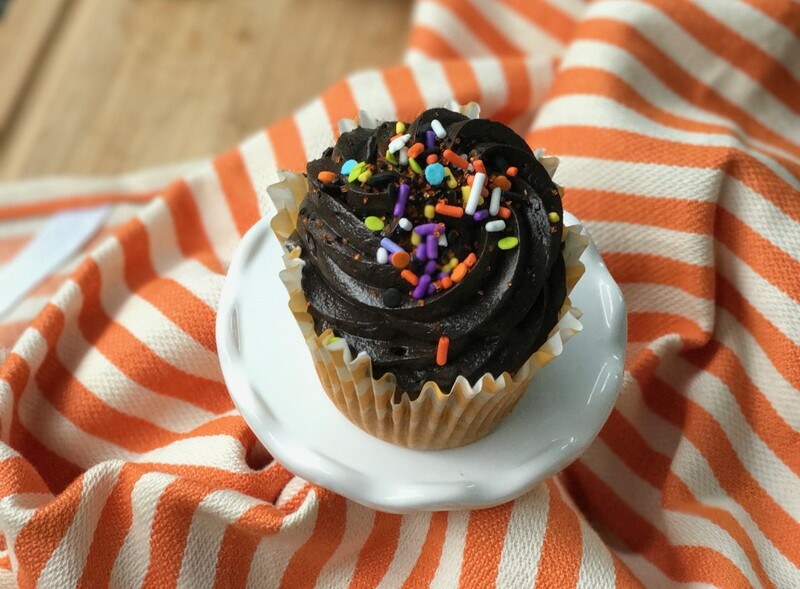 But I’ll get over it once I have several of these cupcakes ;) Chocolate and Pumpkin definitely go together. PS: Happy Early Birthday! Ohhh my gosh these look so good! So jealous of your sugar stash! We bake a lot for Christmas all that sugar would come in handy! You had me at pumpkin, chocolate, cinnamon and cream cheese! Oh my, these look great! 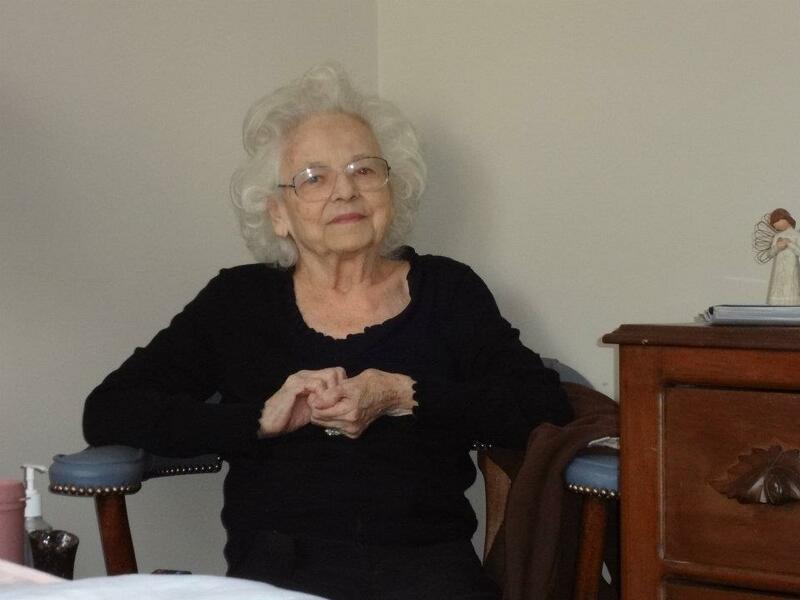 Hi Freda! I am so sorry for the over sight! You add it with the buttermilk & vanilla. I have updated the recipe. Thanks so much for catching & I Hope you’ll make them soon!